Nasal consonants are speech sounds made with the soft palate dropped, which allows the sound of your voice to flow out through your nose. By exploring the nasal consonants that are made on the soft palate, we can exercise the action of the muscles that lift and drop the soft palate, and thereby increase awareness of the actions of the palate. This exercise assumes that you've already read and done the Soft Palate Basics exercise; if you haven't done that yet, you might want to go and read that first. One issue with the soft palate is that there are fewer nerve endings in the back of the mouth, and so there is less awareness of that area. This is good, in that it can reduce your gag reflex, but when it comes to finding more clear articulation of the soft palate, it can make matters challenging. Some people have both a strong gag reflex and limited awareness of their palate, so it's hard to feel, and what they do feel makes them feel sick. For those people, I advise working in short bursts, and taking care to only do as much as you need. Now try making that sound pairing again, but after you've made the [ŋ] sound, pull your tongue down in your mouth. This is a fairly odd thing to do, and it may take a few tries to get it. It also feels quite weird, as pulling your tongue root down (which is stuck to your soft palate) will cause your soft palate to stretch. Most people will agree that that feels kinda gross, to put it bluntly. If you put the "k" stop with no audible release on the end, you'll get a very weird feeling in deed. 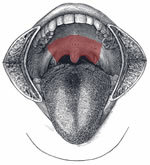 The final exploration for this step is to drop the soft palate to make the [ŋ] sound, and then merely lift the soft palate to make an open [ɑ]. The tongue should stay static, or as close to it as possible, and the action will live in the soft palate. It has been well documented that lifting your cheek muscles helps to lift your soft palate, so if you think of a pseudo-smile as you do this, it will often help to establish the connection. This post is available for download in a condensed format, so you practice lifting your soft palate, and once you know how, you can work along with the recording.